Miro is an all-in-one media centre that can fit in your bag | What Hi-Fi? Miro is a Bluetooth connected, wireless speaker and video streamer that could be the control hub of future smart homes. Miro is an interesting concept, not only because the scale of features that Zbinno - the company behind the Indiegogo campaign for this product - has tried to pack into a product sized a little smaller than a Subway sandwich, but also because it might be a glimpse into the future of controling your home hi-fi. Billing itself as a portable media centre, and looking like a Bluetooth speaker that someone has grafted a 5.5in HD-Ready screen into, Miro can theoretically be used to play streaming services like Spotify or Netflix - controlled either through touch or a remote control that magnetically clamps to the unit so you don't lose it. Audio comes out of the 4cm drivers on each end of the device, through Apple Airplay or Bluetooth. 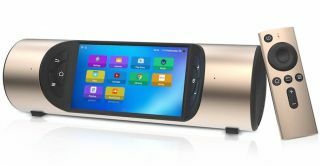 Running an Android 5.1 operating system, Miro has 1GB of RAM, 8GB of storage space for music, apps, and video, and a claimed maximum of eight hours of battery life. While it's unlikely that this little speaker-come-video player will take the world by storm, it's possible that we'll see larger companies bringing out similar products as smart-home hubs. There's already speculation that an upcoming Amazon Echo speaker will feature a touchscreen; Microsoft is bringing out a similar product with its Cortana AI that, combined with Windows 10, it believes will be at the centre of many smart homes. You can back Miro for $209 (approximately £166), with estimated delivery in March 2017; the company has currently raised just under a fifth of its $20,000 goal since launching yesterday. However, as with any crowdfunding campaign, there are no guarantees that the money you put in will result in the same product being delivered, so back with caution.